I am so honored to be one of seven delegates selected by the Guam Democratic Party Caucus to attend the Democratic National Convention in Philadelphia on July 25-28. My fellow Guam delegates include Arlene Bordallo, Clifford Guzman, and Adam Carbullido, Julian Janssen, Rikki Orsini and Robert Taitano. 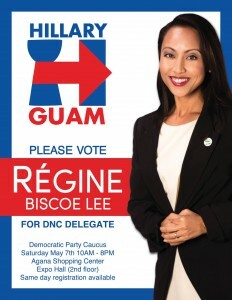 Check out the results from the Guam Democratic Party Caucus held on May 7, 2016.